The NERDTree is a file system explorer for the Vim editor. Using this plugin, users can visually browse complex directory hierarchies, quickly open files for reading or editing, and perform basic file system operations. This plugin can also be extended with custom mappings using a special API. The details of this API and of other NERDTree features are described in the included documentation. Then reload Vim, run :helptags ~/.vim/bundle/nerdtree/doc/ or :Helptags, and check out :help NERDTree.txt. > Is there any support for git flags? > Can I have the nerdtree on every tab automatically? > How can I open a NERDTree automatically when vim starts up? > How can I open a NERDTree automatically when vim starts up if no files were specified? Note: Now start vim with plain vim, not vim . > How can I open NERDTree automatically when vim starts up on opening a directory? This window is tab-specific, meaning it's used by all windows in the tab. This trick also prevents NERDTree from hiding when first selecting a file. > How can I map a specific key or shortcut to open NERDTree? 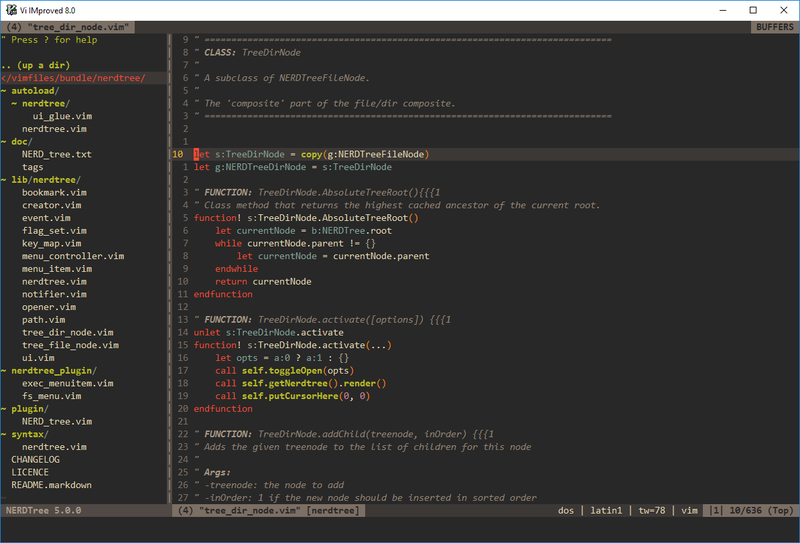 > How can I close vim if the only window left open is a NERDTree? > Can I have different highlighting for different file extensions? > How can I change default arrows?